* The military system with king, knight and jack is the most original one, rather directly taken from Mamluk predecessors with king, deputy king and 2nd deputy. * The same is the case for the German suits (I don't know to what degree they are descendants of the Italian suits, or more directly of Mameluk suits). 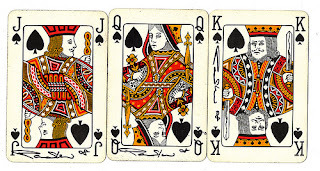 * To better represent the court, in later games including tarot a queen was added. * The modern French suits developed to a stricter representation of the court, reducing the military order, and thus removing the knight. * Today, there are many games played both with French suits and either German or Italian suits. In those games, the "French" queen is identified with the "Italian" knight or the German over for obvious reasons, even though this is historically incorrect and strange enough in the "marriage" group of card games. John of Rheinfelden (1377, very early) reports the normal decks (three male figures), but also decks with Queens, in Freiburg im Breisgau (which is a German city), usually with 52 cards. In a special decks with 60 cards he saw 5 court cards, King, Queen, Ober, Maid, Unter. A similar structure was later repeated by the Hofämterspiel (c. 1455), adding a 6th court figure, the Fool. The Cary-Yale Tarochi with king, knight, fante and three female partners Queen, female knight and female fante went into the same direction. Later in Germany there were a lot of experimental decks, but the usual cheap deck structure had been 3 male figures, but Queenscan't be called rare. France had more Queens then. Italy had Queens in Tarot. Nowadays mostly the French deck form is played in Germany, French suits and with Queens. But in Bavaria (maybe also in some other regions) the decks with Ober and Unter and German suits are still used.